Solar Monitor integrates functions that each PV plant owner will appreciate. It monitors following figures and provides following outputs. We prepared several publicly available Solar Monitor units on a real PV plants. Click through the PV plant name will take you directly to the web interface of the Solar Monitor on a remote site. So you can look at their performance and current data online. Use the right column to click to a collected data of the PV plant on the web portal portal.solarmonitor.cz. 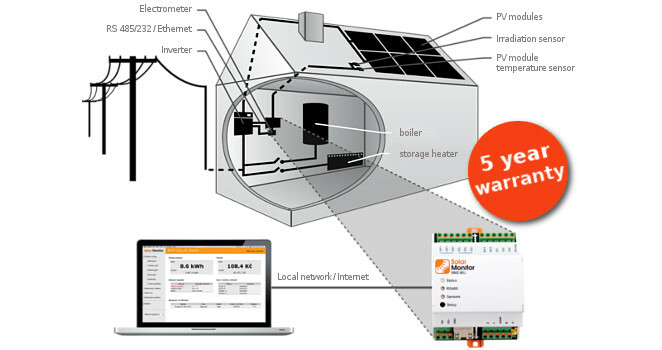 The web portal allows you to monitor your PV plant over the internet from anywhere, even without a public IP address. Extends the number of inputs and outputs (for other appliances, sensors and output relays). Controls PV plant’s production according to consumer’s instructions. Increases the number of devices that can be connected to the Solar Monitor unit with digital inputs. Enables sending information via text messages.